We specializes in Wholesale Clothing and Wholesale Fashion Clothing. We are proud to bring the customers an amazing assortment of products. We carry top quality fashion from, hundreds of Los Angeles area manufacturers and importers. The products include assortment of wholesale skirts, dresses, pants, jackets, cardigans and much more. We also have a wide selection in wholesale tops, (causal, cardigans, basics, seamless, etc). We offer variety of styles of wholesale clothing. Whatever the customers are looking for, we probably carry them. We carry wide arrange of sizes, colors and styles. We only carry the best products. Our products are top of line in quality, style and prices. We guarantee the best in all three aspects. As the premiere online wholesale clothing shopping store, we pride ourselves in offering the best customer service, fast and efficient processing on orders. We understand how important each customer is. We provide special care in each one of you. We make sure that our staff is well trained and well informed, so that each customer can find exactly what they are looking for. Furthermore, each customer will receive the special attention they need. Our efficient and fast processing time, guarantees that each order will be processed and shipped in fastest time. Our highly qualified and well-trained staff, will show dedication and professionalism to all orders. Wholesale Fashion Yetts is among the best boutique apparel wholesaler around. We offer the customer variety of choices in garment options and our selections of apparel choices are top quality. 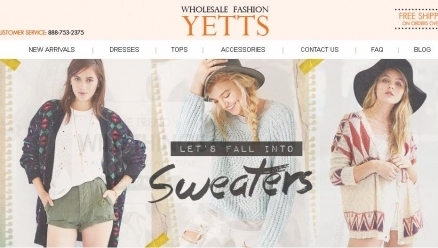 For all wholesale clothing apparel including, tops, pants, skirts, dresses, jackets, cardigans and much more, in the latest style wholesale Fashion Yetts is the one stop shop.